Nowadays, this is not a problem, because all electronic devices are now multi-voltage. There is one inconvenient, if the voltage in your country is greater, smartphones, tablets or laptops can take more time to charge their batteries. 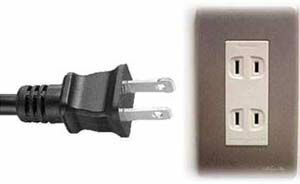 But there is something more important: the kind of plug needed for your electronic devices must have an A/B plug (two parallel flat plugs or two parallel flat plugs and a third round plug). You must take into account how your country's plugs are, and if they do not match, it is advisable to buy a plug adapter, although in your hotel they can lend you one.